Since moving across the country (for the second time in two years), I’ve become fond of all things streaming. I liked the idea of streaming before, but now that I live the reality, I love it. 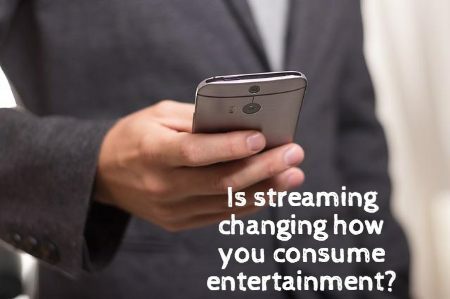 One of the things I’ve noticed is that streaming offers wide access to entertainment, but I don’t need to clutter up my home — and I can take my favorites with me wherever I go, thanks to the cloud, the Internet, and data streaming on my phone. I’ve been very interested in keeping my home clutter-free since my divorce. I don’t want to accumulate a lot of things. Each thing I’ve bought (the drill, the furniture, the kitchen utensils) has made me a little apprehensive. I don’t want to live weighed down by things. I like open spaces and I like the idea of traveling through the world lightly. Buying a bunch of Blu-rays to clutter up my home isn’t conducive to this goal. Streaming has been great. My son and I watch TV shows using Netflix, Hulu, and Amazon Prime. We enjoyed Ant Man, Age of Ultron, and Inside Out quite a bit. These are the first movies I purchased without getting a physical copy. I also stream a lot of my music. Rather than buying albums and tracks individually, I pay a fee for Spotify and sometimes stream Pandora for free (I’m willing to put up with the commercials). Streaming using Spotify means that I can access my playlists from anywhere, without taking up a lot of space on my devices, and I can even use it on multiple devices because I’m paying for Premium. These might be small things, but they aren’t taking up space in my home, and that matters quite a lot to me. Another thing I like about streaming is that it allows me to bring my entertainment with me. I recently helped compile a playlist for a gala event. All we had to do was plug in my device and stream the playlist. It worked out really well. It also means my son can quickly access entertainment while we’re traveling. He’s used our streaming services to watch shows and movies while on the go, or while sitting in a hotel room, waiting for the next activity. It’s been very convenient for us to bring the entertainment along — without being burdened by disks and extra devices. Even my phone can handle the streaming. All I need is a pair of earbuds and I can listen to music or watch something. I’ve even benefitted from my Kindle in much the same way. I have a paperwhite (great for reading in bed), but I also have the Kindle app on my phone. If I’m stuck somewhere, I have access to my entire library in the palm of my hand. I’m never without something to read. Of course, there are downsides to all this streaming ability. First of all, I am interested in making sure my son doesn’t spend too much time on his devices. It can be tempting to turn to streaming entertainment as the easy solution to just about anything, so this means I have to be aware of the situation and make an effort to limit his screentime. Another downside is that it’s difficult to access all this great entertainment if you end up in a situation without access to the cloud or the Internet. I can use the data on my phone to keep streaming music, as long as I’m not in the complete middle of nowhere. However, I need to be careful when doing this because I don’t want to use so much data that I end up paying extra money on my smartphone bill. You need to plan ahead if you want access to something when you are without Internet access. Finally, I do feel a little apprehensive of the fact that I could lose some of this entertainment. While I have bank statements and emails that confirm that I’ve bought certain items, the reality is that if something goes wrong, I could lose the things I’ve paid for. Most of the streaming, though, is for a monthly service, like a rental. But that doesn’t mean I can’t lose access, though, since if the company shuts down all my playlists and TV show preferences would be lost. So far, though, the streaming experience has been positive for me, and worth the risk of the downsides.